Yesterday my son Josh and I climbed the big dune at Sleeping Bear Dunes in northern Michigan. This dune is 450 feet high! It took me an hour and 15 minutes to get back up the dune. It took most people an hour or longer. At one point Josh said to me, "You're the oldest person I've seen who went all the way to the bottom and is climbing back up." This was a compliment. It has its dangers. See this Chicago Tribune article "When common sense takes a vacation." "During his 25 years as a park ranger, [Tom] Van Zoeren has rescued dozens of summer vacationers from threatening situations triggered by their refusal to obey warning signs. He said that in a few cases park visitors have died as a result of heart attacks suffered while climbing the steep dunes. Of the dozen or so yearly rescues from Sleeping Bear Dune, three or four are emergencies that require a helicopter, park officials said." I took this photo going down the dune. 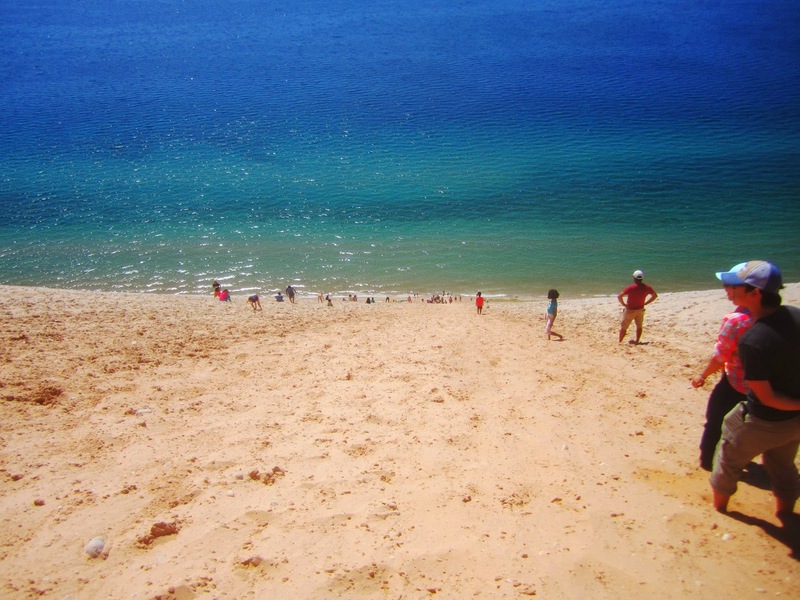 "At Sleeping Bear Dunes, the trip down is easy, and takes only five or 10 minutes. But then the frolicking tourists make a sudden, grim discovery." Here's a photo I took from the lake shore looking up the dune. "To return to their cars and their waiting friends or families, they will have to climb the equivalent of a 34-story skyscraper at a brutal angle of 33 degrees, an incline 10 times steeper than those found on most hiking trails."